If you’ve noticed an increased number of patients with symptoms of periodontal disease, it might be time to change your educational tactics. By purchasing the Toothflix® 2.0 dental patient education video Preventing Periodontal Disease, you’ll discover a versatile patient communication tool that can help boost health awareness and informed consent among your patients. With just a web-enabled device, this video is available in treatment rooms and on the go. Studies have shown that people with periodontitis are at higher risk for other health problems such as heart disease, stroke, and diabetes. This correlation between oral hygiene and health may come as a surprise to some patients, and your word alone may not be enough to convince them to kick old habits. This video contains up-to-date content based on ADA’s rigorous clinical standards, and includes patient-doctor scenes to help put your real-life patients at ease. The best part? It’s available on-demand with purchase through your online ADA e-Bookshelf account! 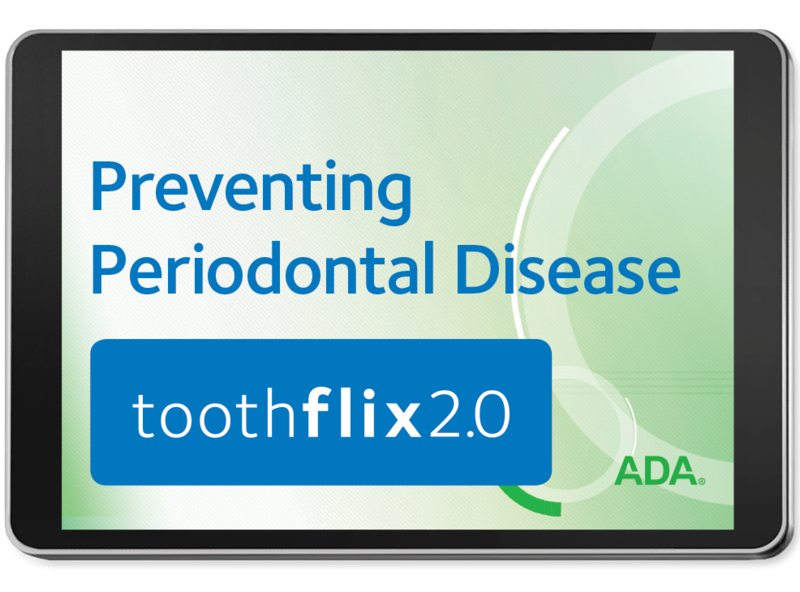 For more information about our updated line of Toothflix 2.0 videos, please visit ADA.org/toothflix.Add a powerful weapon to your fight against periodontitis by ordering Preventing Periodontal Disease today!